Today, Treasury Secretary Steven Mnuchin and Chief Economic Advisor Gary Cohn outlined President Trump’s proposed tax changes. During the presentation, they summarized the president’s proposal to cut the number of income tax brackets to three, with respective rates of 35%, 25% and 10%. Other proposed changes include a corporate tax cut to 15%, elimination of many tax deductions, as well as a removal of the estate tax and alternative minimum tax (AMT). These proposed changes align closely with the president’s campaign plan. Though it was not indicated when legislation would be introduced on these proposed changes, Mnuchin expressed that he would like to see it passed by the end of the year. Mnuchin and Cohn revealed that Trump’s proposed tax changes would cut the corporate tax rate from 35% to 15%. The plan would cut the top 35% corporate income tax to 15%. While few businesses pay the top 35% rate, those that pay something close to it are in line for a huge tax cut. 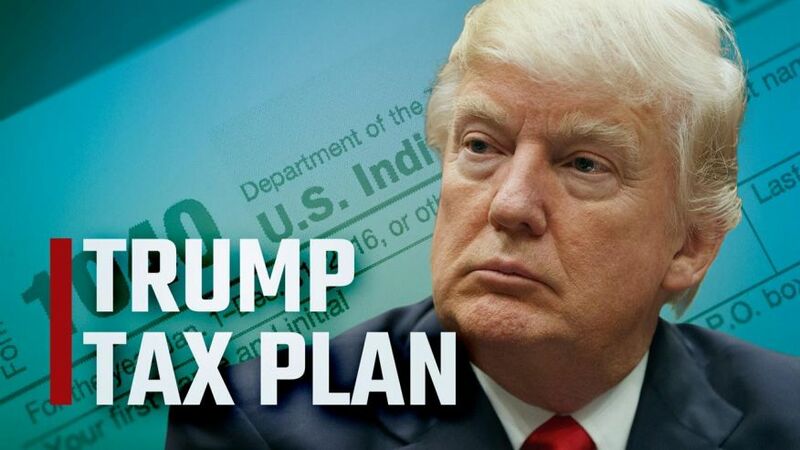 Trump’s proposal would lower the corporate tax rate from 35% to 15%, and it would also allow millions of small businesses, structured in such a way that they are affected by the individual tax rate, to use the 15% rate as well. These businesses, known as “pass-throughs” or “S corporations,” are often small, family-owned companies. The 15% business tax rate could open a huge loophole for people to receive business income through a limited liability company or other pass-through entity instead of taking wages. Depending on how the law is drafted, this could enable business owners to pay the lower 15% rate on their earnings instead of an individual income rate up to 35%. This proposed plan will cut the number of tax brackets from seven to three. The tax brackets will top at 35%, being lowered from the current top tax rate of 39.6%. The other two tax brackets are proposed to be 25% and 10% respectively. The standard deduction for taxpayers is also proposed to be doubled. Income ranges for the three brackets were not released. With the exception of mortgage interest and charitable contribution deductions, all tax deductions are proposed to be eliminated. The proposed plan includes the removal of both the estate tax and alternative minimum tax (AMT). In addition to the proposed changes above, the plan also contains the intention of having a one-time-tax on corporations overseas, as well a “territorial” tax system. In-depth details were not given on those proposed changes. 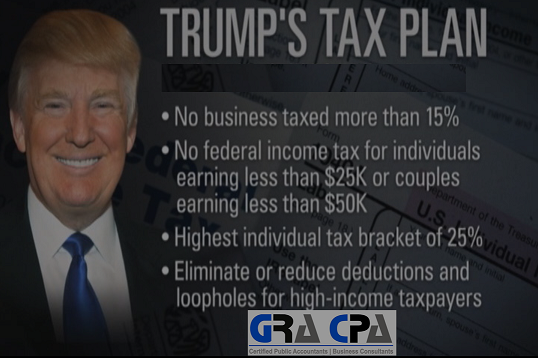 As of right now, Trump’s proposed tax changes align closely with his campaign plan, as well as the House GOP blueprint. However, Cohn assured that there will be continued discussions with the House and Senate to solidify plan details. Though it was not indicated when legislation would be introduced on these proposed changes, Mnuchin expressed that he would like to see it passed by the end of the year. Currently, there is no guarantee that the President Trump’s proposals will have majority support from either party. For this reason, it’s more important than ever to stay up-to-date on all proposed changes as they move through Congress. GRA CPA is here to provide you with the information you need during these uncertain times.